The stars and tree are from a Hero Arts set called Merry Christmas Trees. I topped my tree with a pearl (what else?). Hurricane Sandy is headed our way soon (I'm in New Jersey). Reeealllly hope we don't lose power. My thoughts are with everyone who will be affected by this big storm. Hugs! very pretty..love the design on the tree..
Loooove that holly EF!!! WHo is it by? Darling card and a great take on the sketch. I hear you re: being a slow card maker! Hope you stay safe and sound!! Gorgeous card! I hear ya on being slow...I'm am most certainly the same way. Sending warm and safe thoughts during the storm. How sweet. I have my eye on that tree. I need that tree as a matter of fact....lol Your layout is perfect to showcase that tree...can you tell I love that tree!!! This is BEAUTIFUL!! I loveeeeeeeeeeee that tree!!!!! I love your use of the doily die with the sketch. The tree is beautifully accented with the doily and the gorgeous colors. So glad to see you at CAS(E) this Sketch! Gorgeous! 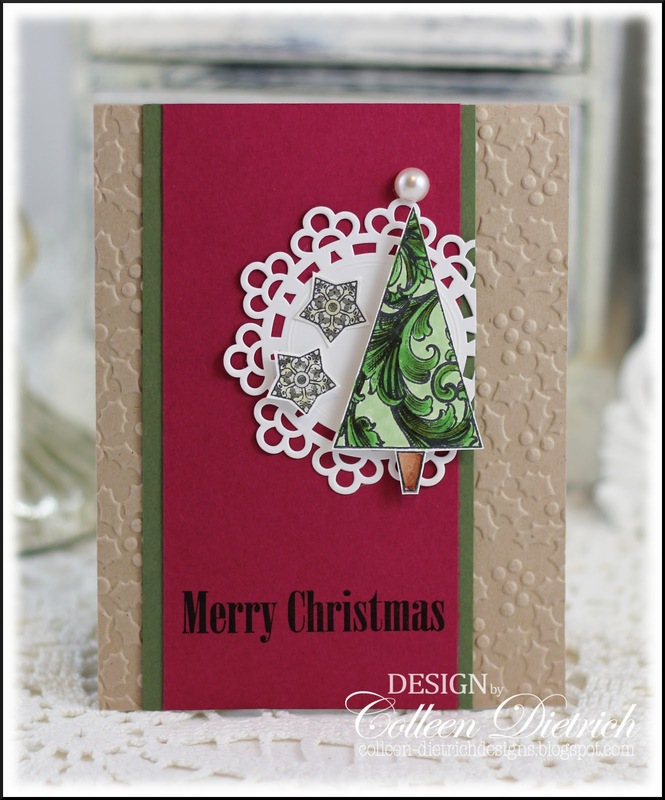 I love the embossing and the flourishes on the tree. Thanks so much for playing with us at CAS-ual Fridays! Gorgeous card Colleen! 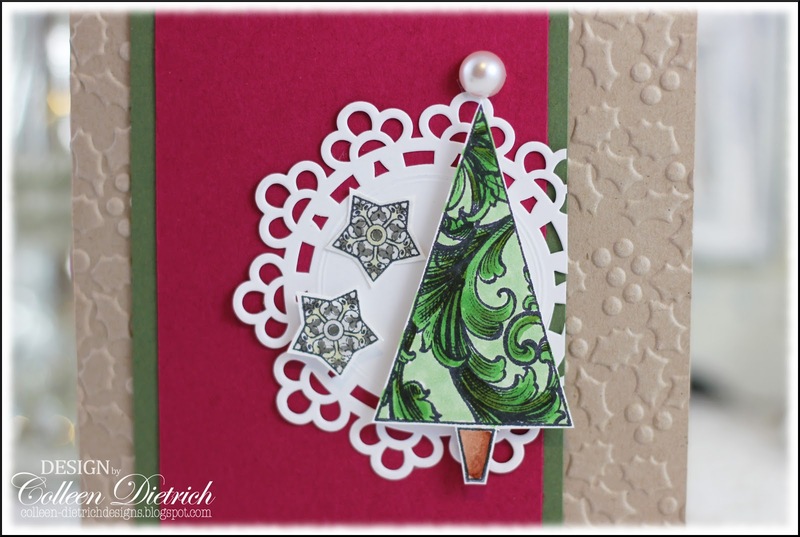 Love the paper you used on the tree and that embossing folder is FAB!! Lovely lovely tree and you show cased it perfectly! Pretty embossed background, too! May you stay safe and sound with power! I hope hurricane Sandy simmers down soon! Take care, hugs! Oh wow I love the holly embossing on your Kraft card base Colleen and the pretty doily behind your pearl (of course) topped tree!! Want to know something creepy. Just as I read about you not wanting to have a power outage my iPad went black!!! EEEK creepy huh.....keeping all of you east coast folks in my prayers. This is so beautiful, love all the details and the colors. I am slow too, it's our attention to detail. lol. Colleen this is just beautiful. I saw Kraft was the theme at CAS-ual Fridays and cringed. But you made it look so beautiful! I thought y'all were supposed to evacuate. Must have just been one area. Stay safe because this is not a storm to play around with. Maybe you can craft away and not be worried LOL. Cool! I love that paper you used for the tree! Great colors. Yeah, who makes the embossing folder - love it. Stay safe and dry with the storm. We will be thinking about you and all others impacted by Sandy. This is such a pretty Christmas card Colleen! The embossed kraft card base is wonderful. So glad you played along in this week's CAS(E) this Sketch! Very creative, warm, and so pretty too! Another absolutely wonderful creation. You just keep churning out the most beautiful things! Hugz! Colleen, I hear ya when you are talking about being a slow crafter. I spent a lot of time Saturday in my craftroom and I managed to create 3 cards and work on a Halloween treat project. You card is fabulous and that embossing folder is spot on. Thanks for joining us this week at CAS-ual Fridays! Love that little tree! Very pretty Christmas card, Colleen! I hope you made it through Sandy OK! So great to have you here Colleen! Love your card! Fabulous texture and I love that tree :) Thanks for playing this week at CAS(E) this Sketch! Wowzers! This is gorgeous!!! Thanks for playing along at CAS(E) this Sketch!